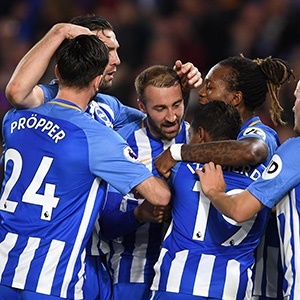 Brighton - Jose Izquierdo earned Brighton and Hove Albion a point as Chris Hughton's side twice came from behind to record a 2-2 draw against visitors Stoke City on Monday. Brighton - promoted from the Championship last season - remain ninth, seven points above the relegation zone and three points above Mark Hughes's Stoke, who stay in 15th. "When you have been behind twice you have to show character and we did," Hughton told Sky Sports. "We have to be realistic. We are playing against better teams and better players and if you can't win games then don't lose them." Xherdan Shaqiri's fine, raking pass from the halfway line fell perfectly into the path of Choupo-Moting, who expertly plucked the ball from the sky before planting a shot past Mat Ryan. The home fans - and players - were enraged when Glenn Murray appeared to be felled inside the box by Stoke captain Ryan Shawcross, only for referee Lee Mason to award a goal-kick. Anger turned to celebration in the 44th minute when Brighton midfielder Davy Proepper's twinkle-toed run took him into space on the right and his low cross was driven past Lee Grant by Gross. After Zouma had failed to cut out a high ball, Izquierdo's attempted cross from the left came back to him and the Colombia winger lashed the ball past Grant. Shaqiri lashed narrowly wide from outside the box, but despite the introduction of Peter Crouch -- who made a Premier League record 143rd substitute appearance -- Stoke could not get their noses back in front. "Brighton didn't create much, so we are disappointed with their goals," said Stoke manager Hughes. "It's an away point and you have to be happy with that."